5 Extras! Simplicity Brother SB7500. Combination sewing and embroidery machine. This powerful machine was designed with affordability in mind and loaded with high-end features. Introducing the Brother™ Simplicity® SB7500. 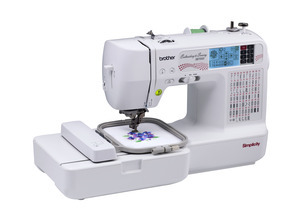 Beautiful embellishments are at your fingertips with Simplicity® by Brother™ SB7500 combination sewing and embroidery machine. This powerful machine was designed with affordability in mind and loaded with high-end features. Refresh your repertoire with 70 built-in embroidery designs and over 100 more designs on an included resource CD. Over 5000 more are conveniently within reach at iBroidery.com. The large, back-lit, easy-to-use LCD touchscreen display is full of features to complement your ongoing work, and the premium needle threading system with push button thread cutter make embroidery not only fast, but easy and fun. The Simplicity® by Brother™ SB7500. Let your creativity explode with simplicity. Maximum Embroidery Area (X x Y): 4" x 4"
Machine Dimensions (H x W x D): 10.94" x 6.89" x 15.55"